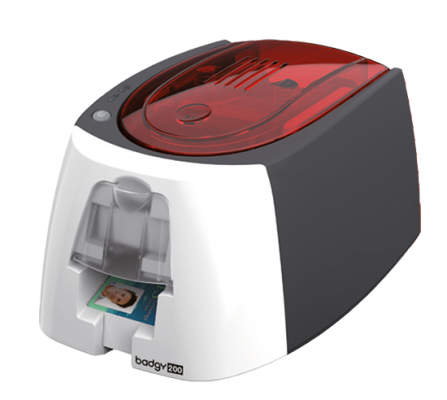 Badgy provides you with a turnkey solution, for PC or Mac, consisting of a plastic card printer, the Evolis Badge Studio® card personalization software, and a pack of consumables (color ribbon and blank plastic cards) for 100 prints. In addition, a free card template library is available at www.badgy.com, where you can personalize the template of your choice, adding text, logos, photos, barcodes, and more. Badgy200 allows you to print your own cards instantly and completely independently. Print your badges as you need them – as single cards or in small batches. Badgy200 has an output of 95 color cards per hour. You can also import data from a database, adding information to your card designs in a single click, and launching a print run of your badges with one command, including variable data. 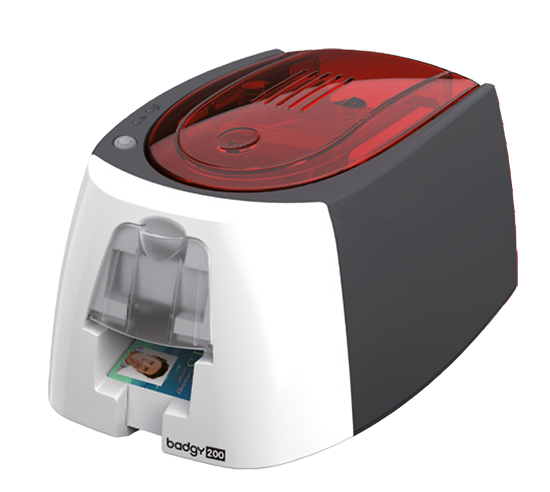 The Badgy200 printer generates personalized plastic cards, with professional-quality, edge-to-edge printing, highlighting your organization’s brand image. The Badgy200 is installed and used like a standard offi ce printer. You load the cards in the feeder and retrieve them from the output hopper, both located on the front of the printer. With the Badgy Premium Suite® software, you can easily control the printer from your computer, by receiving notifi cations. The Badgy print ribbons are easy to install and automatically recognized. The Badgy200 printer is smaller than an A4 sheet of paper, which means it can fi t easily into any workspace. Thanks to its light weight (just 1.7 kg) and its carrying bag (sold separately), the Badgy can easily be transported. Graphic printer notifi cations1: cleaning alerts, end of ribbon alert, ribbon due to end, etc. To maximize the quality and durability of the printed cards, the lifespan of the print head, and the overall printer reliability, use the recommended ribbons.